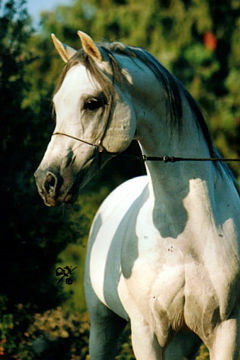 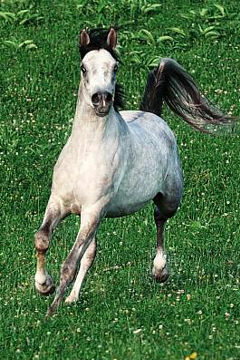 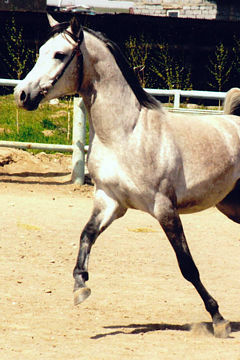 SHEIKAN STAR, Grey Stallion, *1992 (Shereik / Anouk). 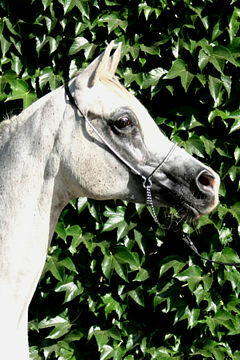 Breeder and Owner: Mrs. Margje van der Starre. 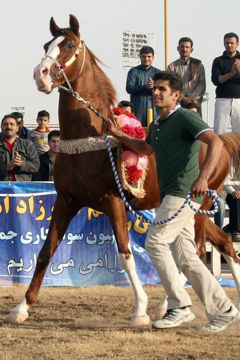 Strain: Hadban Enzahi (Elsissa I). 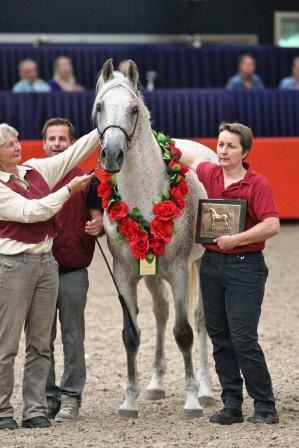 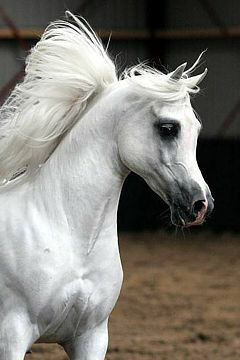 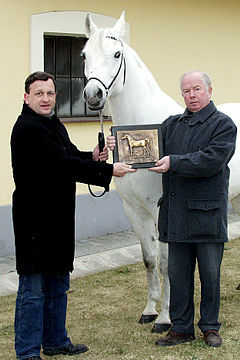 In his birth year of 1992 Sheikan Star became Reserve-Champion colt foal at the Dutch National Championships. 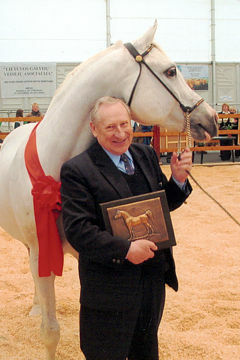 His best international placing in halter was a 3rd place in his junior stallion class at the Salon du Cheval World Championships in Paris. 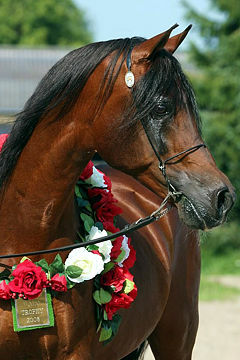 Sheikan Star then went on to have a fantastic career as a racehorse himself, and later as a sire of many sporthorses. 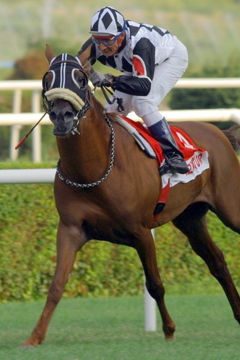 On the race-track he took first place 14 times, second place 9 times, and he also has 11 third place finishes on his impressive record. 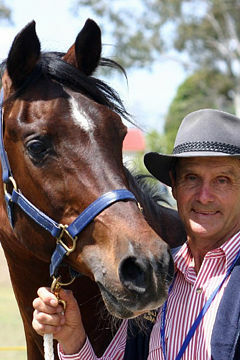 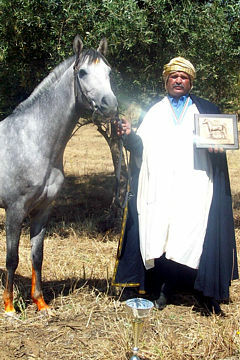 With this list of achievements he made it up to 71 kg of General Handicap and earned himself a Studbook Sporthorse Achievement Award for racing. 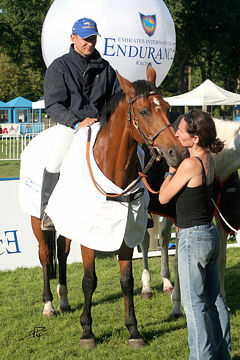 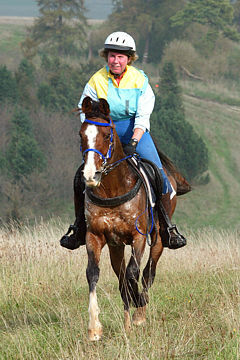 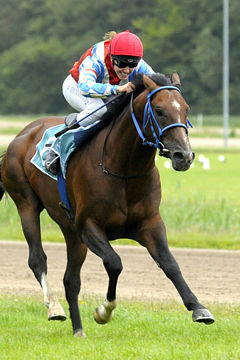 Shamor Star, out of Aronda Star, born in 1995: Winning racehorse and 2002 Dutch National Champion Endurance level II. 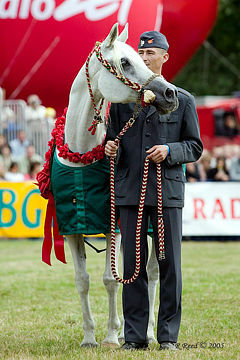 Nibbles Ben Star, out of Grimston, Anglo-Arabian born in 2001: 2001 Reserve Champion Belgium National Championships and currently Endurance level III. 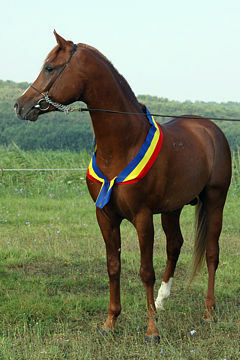 Nib Karaskan Star, out of Agar’s Haracha Star, born in 2001: Winning racehorse and champion level III Endurance, currently competing in level IV. 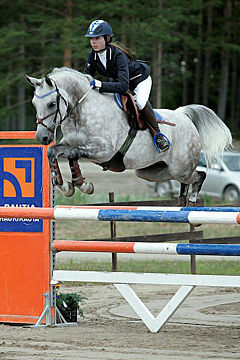 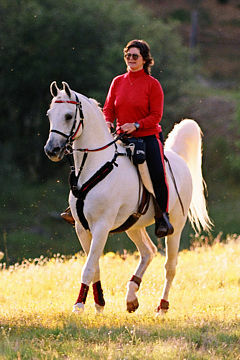 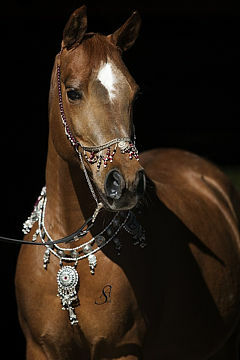 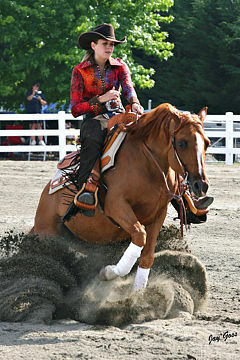 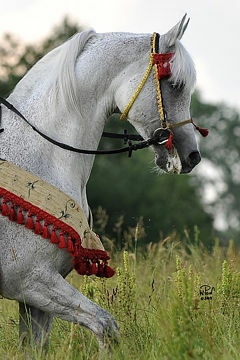 Shakaan Al Jarra, out of Hamasa Fasiha, born in 1999: Currently competing in Endurance level III. 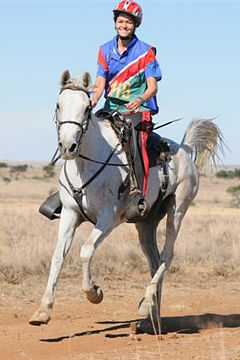 Kain, out of Hamasa Fasiha, born in 2004: Currently competing in Endurance level II. 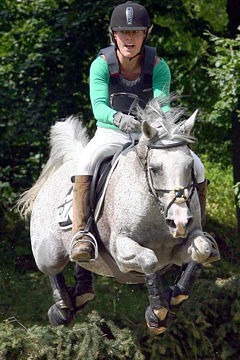 Pure Nature Jair, out of Maropz van de Pakop, born in 2004: Currently competing in Endurance level II. 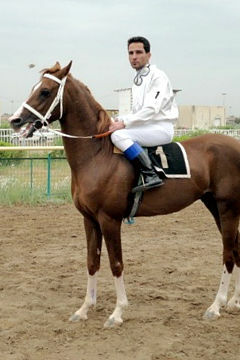 Nib Kannie Star, out of Rachanie, born in 2003: Currently competing in Endurance level I.
Shadibh Star, out of Zadibah Star, born in 1998: Winning racehorse. 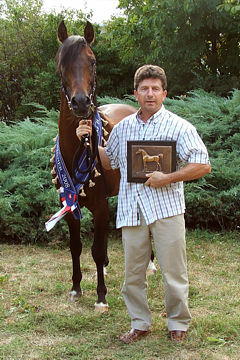 This impressive list of achievements and his well-performing offspring earned him the WAHO Trophy for the year 2009. 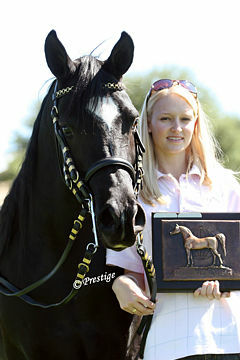 The Trophy was presented by Mr. Gideon Reisel, Registrar of the Dutch Studbook, to Sheikan Star’s owner/breeder Margje van der Starre, on the occasion of the Dutch National Championships, 12 September 2009. 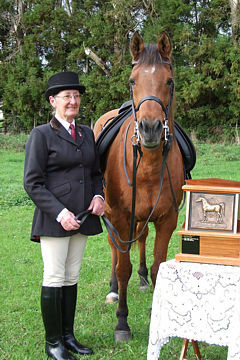 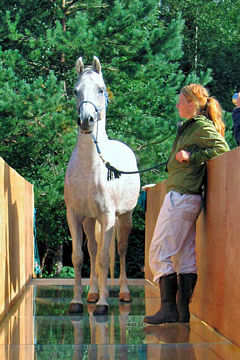 L-R: Breeder and owner Margje van der Starre; Aurid Muskee; Marjo Scholts.